Looks much more American Pit Bull Terrier / Staffy to me. He's definitely not an American Pit Bull Terrier but he's definitely an American Bully. 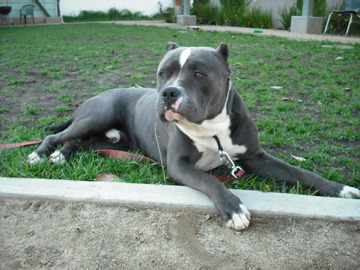 I'll post some links of pictures below of American Bullies Here are some pictures of some blue and white American Bullies - http://pic90.picturetrail.com/VOL2233/11690540/20777235/386410460.jpg http://i.oodleimg.com/item/3061334182u_1x424x360f_dogs_in_lawrence_ma/?1338764152 http://farm4.staticflickr.com/3441/3773832590_3072d83ee0_z.jpg?zz=1 http://farm4.staticflickr.com/3572/3819965257_e461675e62_z.jpg?zz=1 http://24.media.tumblr.com/tumblr_lzbesktQlx1r8o4kko1_400.jpg American Bullies are not pit bulls so please do not call them pit bulls because they are not pit bulls, they are American Bullies. If you want to learn more about the differences between American Bullies and American Pit Bull Terrier, join the forum http://www.gopitbull.com/ Merrick is a great food to feed, learn more about Merrick at http://www.merrickpetcare.com/ Merrick has grain free dog food which is a plus for any dog. Dog's don't need grains in their diets. Merrick is one of the best dog foods that you can feed to your dog. There's many different formulas to choose from which makes it easy to choose the perfect one to feed to your dog. He looks a lot like my grandpuppy goliath who was amstaff/ampitbull mix.......the mom ( my dog buffy who has passed away in 2001. was an am/staff and the dad was a beautiful am/pitbull. I will try to post his photo on my Lefty's page for a day so you can see him.. As for food I would recommend either Taste of the Wild or Frommes..both are great and my vet recommends it as well.